Comments Pearls are formed randomly and are simple accidents of Nature! When an irritant becomes lodged in a mollusc, the animal responds by secreting nacre to protect itself, and over years it becomes a Pearl! That’s how Natural Pearls are formed and that’s also why Natural Pearls are rare and hard to come by! 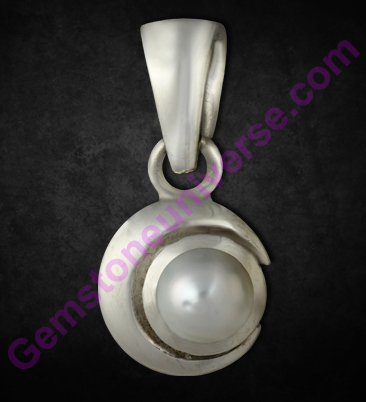 This Natural Pearl from the Australian sea is a fine specimen! Filled with the calm and serene energies of the planet that rules not only the mind but also the oceans, which make up 75% of our planet – Moon! Set in a sterling silver crescent pendant and all set to grants its immense gifts!